Just over a year from my last update, it’s once again time to fill you in on the current state of the game. In addition to 125 quests and deeds, the update continues the Black Book of Mordor (which has largely replaced the Epic quest line) and introduces new episodic content - The Lay of Rust and Rime. Three factions (or kingdoms) exist in the region and achieving kindred with each allows players to access BiS rewards. The level cap remains at 115. The Abyss of Mordath (raid), Dungeons of Naerband (6-man), and Court of Seregost (3-man) make up the current endgame group content. The 105-level Battle of the Pelennor Fields cluster (released with Update 18) was not scaled and is now seldom played as a result. COS is frequently run at 105 (T1 and T2) as it drops many LI scrolls and - very occasionally - BiS offhand barter items. Dailies! Daily quests from both the three factions mentioned above and the Allegiances (the racial faction system which launched with Mordor) reward Black Steel Keys. These keys open Gorgoroth Steel-bound Lootboxes, which in turn reward 'Ashes of Enchantment'. Still with me? Essentially, to reduce the grind, rare items that drop via RNG can also be bartered for by deconstructing other rare items into 'ash'. That way, those players who can't run the raid (or do but that one item never seems to drop) can still access particular items. 'Ash' can also be bartered for essences, housing items, mounts and pets. Featured Instances. Every week, a specific scaling instance (or raid) from LOTRO's old favourites is featured in the Instance Join panel. Characters level 100 and higher can run these daily at level 100-114 and at cap (115). In addition to the regular loot, each of the two runs has a specific featured quest and extra rewards associated with the instance. PvMP. Still going strong on Laurelin, but players typically only log in the evenings and at weekends. Balance is an issue at present and devs have warned it will not be addressed until freep-side class balance changes are complete (more on that below). Major class changes are afoot in an attempt to address growing imbalance amongst classes. The changes are varied and comprehensive. Some have been welcomed - others ridiculed - but the devs have made many adjustments based on feedback. They are too numerous to list here, but this link leads to the BR sub-forum focusing on each class. Update 22.2 will also bring a 'region polish' to Breeland and southern Ered Luin. "Expect to see fewer impassable cliffs – and polished impassable cliffs where they are needed. Some terrain textures have been replaced with newer, better looking textures. New waterways and polished water materials have been added to make the landscape feel more like an ecosystem. Trees and frills have been updated in places to take advantage of newer and more detailed assets. Plus – a few small surprises have been added here and there to keep things interesting." The official thread - and photos - can be found here. Update 23 will increase the level cap to 120 (+5). 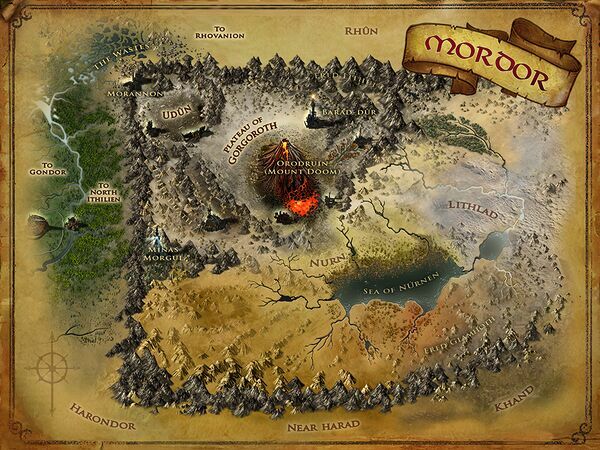 The Iron Hills and the Grey Mountains will have 80 new quests, and the Black Book of Mordor will continue its story. Update 23 will also come with an instance cluster and, later in the year, a new raid. "Beyond Update 23, we have some threads to tie off before we are done with North Rhovanion, including Gundabad, the Vales of Anduin, and landscape contiguity with Lothlórien". The return to Mordor - specifically, Minas Morgul - is projected for 2019. Further waves of class balances and "incremental improvements" will continue beyond Update 22.2. LOTRO’s PC (playable character) avatars have been updated! However, those who like their old appearance can toggle between the two. Man and Elf avatars were updated with Mordor, Dwarves with Strongholds of the North. Still waiting on Hobbits. However, Beornings and High Elves - being later releases - have not required much work. SSG have confirmed efforts towards a 64-bit client are currently on hold while other issues take priority. But it is something they're actively considering and researching. >>'Ash' can also be bartered for essences, housing items, mounts and pets. I would also add that ash can be exchanged for new top-tier relics for your LIs at a small camp next to Ruins of Dingarth (Dor Amarth stable-master). I only discovered this some days ago and was pleasantly surprised. Really?! Awesome, though obviously I want to run Abyss. Thanks for the synopsis Aro.